Who says simple can’t be delicious, or elegant? Not me, or Leonardo apparently. This recipe has only one “sophisticated” ingredient. It’s truffle oil. You can get it many places, at upscale gourmet shops or even your local grocery. I purchased mine at Winners/HomeSense, our local chain “discount” store. They have a wide selection of gourmet items, usually more at Christmas. I probably did buy it around the Holidays, but have had mine for quite a while. It keeps. Truffle oil is (usually) olive oil that is infused with the essence of truffle – that heady and costly fungus. It’s a less expensive way to impart that deep flavour than with the truffle itself. Truffles are among the world’s most expensive natural foods, being in use as a culinary item since the ancient Sumerians. 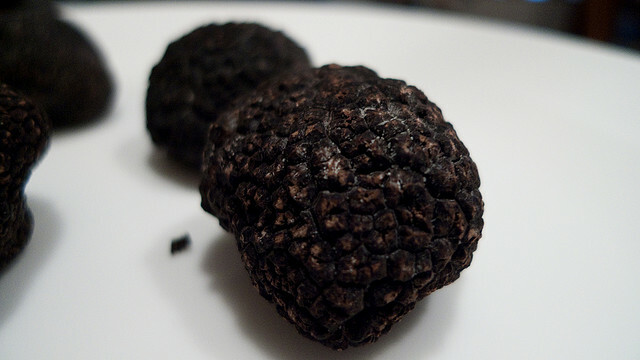 Two types of truffles are the most well known: the French black and the Italian white. Their flavour is very musky and are irreplaceable as an ingredient. They are extremely pricey, usually selling for about €600 to €800 per kilogram. Sometimes you can find them preserved in a little oil in a very, very small jar. So truffle oil it is for me, at about $10 per 300 ml. (You can find it much more – and much less – expensive.) A little goes a long way. This recipe was simplicity itself. Heat some truffle oil in a pan, sear the chops in it with salt and pepper and then finish in the oven with the crust patted on top. Since the oven was in use anyway I baked thick slices of cauliflower with a little oil drizzled on them. Sometimes a glass of wine is called for with dinner. I received a bottle of wine as a gift recently and thought it was time to uncork it. 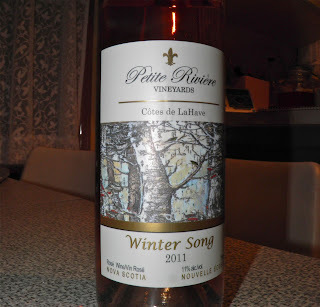 It was from a Nova Scotia winery, Petite Rivière Vineyards. 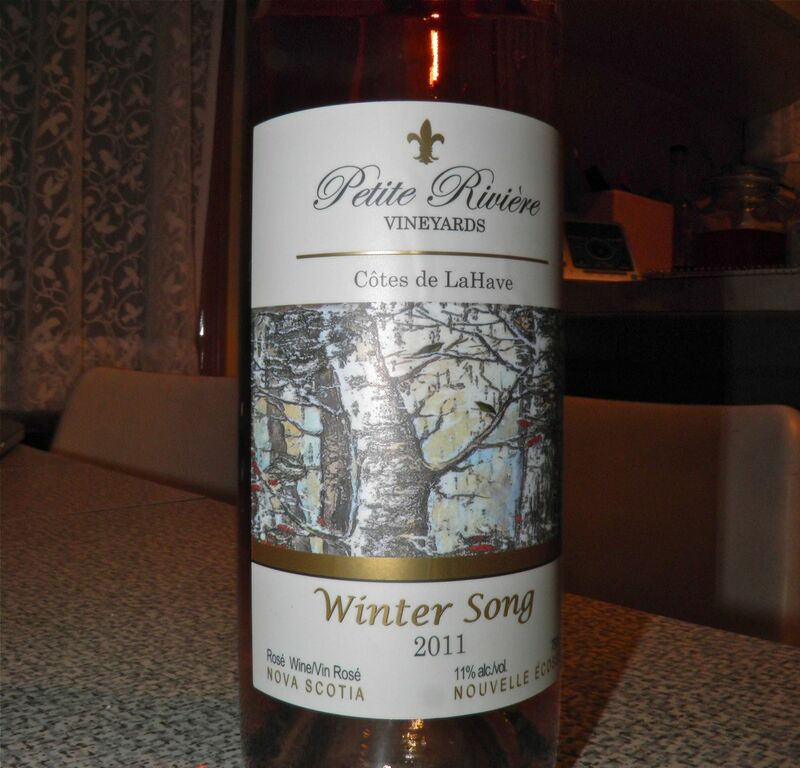 It was a 2011 Côtes de LaHave “Winter Song” Rosé. I believe it’s only available via their online store or at the winery in Lunenburg County. Their web site is www.petiterivierevineyards.ca. A very nice wine, and locally made. This was a great gift. I’m usually not a fan of rosé but this one won me over instantly. It’s made from a blend of Léon Millot, L’Acadie and Chardonnay grapes, finished with cranberries. It is supposed to pair well with pork or game. I found the slight acidity perfectly cut through the heady truffle of this dish. The nose was quite fruity, and to my uneducated protuberance, strawberry. I believe that was due to the chardonnay. If I hadn’t known there was cranberry I would have been hard pressed to guess. Once you knew, yes. At about $16.50/750 ml it’s a nicely priced wine, too. Petite Rivière is most famous for its reds, because of its terroir. I can’t wait to try one. But back to the recipe... The hardest part of this dinner was processing the nuts and bread. How hard is that? The result is simple, yet sophisticated – a great dinner to have after a beautiful day out working in the yard. 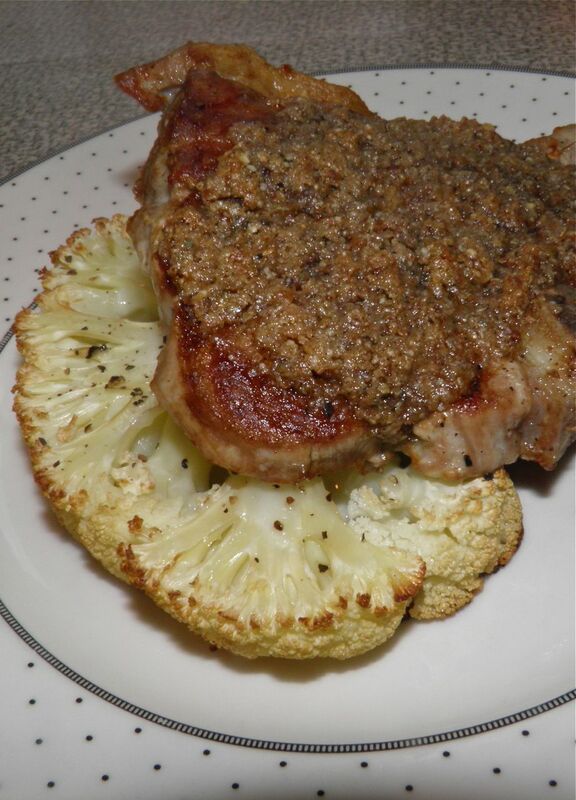 If making the baked cauliflower, slice into 1” thick pieces and arrange on a parchment paper-lined baking sheet. Drizzle with truffle oil, sprinkle with salt and pepper and bake for at least 45 minutes. The cauliflower will brown on the edges. Heat the truffle oil in an ovenproof pan. Sprinkle the chops with salt and pepper and sear in the hot oil on both sides. Pulse the almonds in a food processor until well ground. 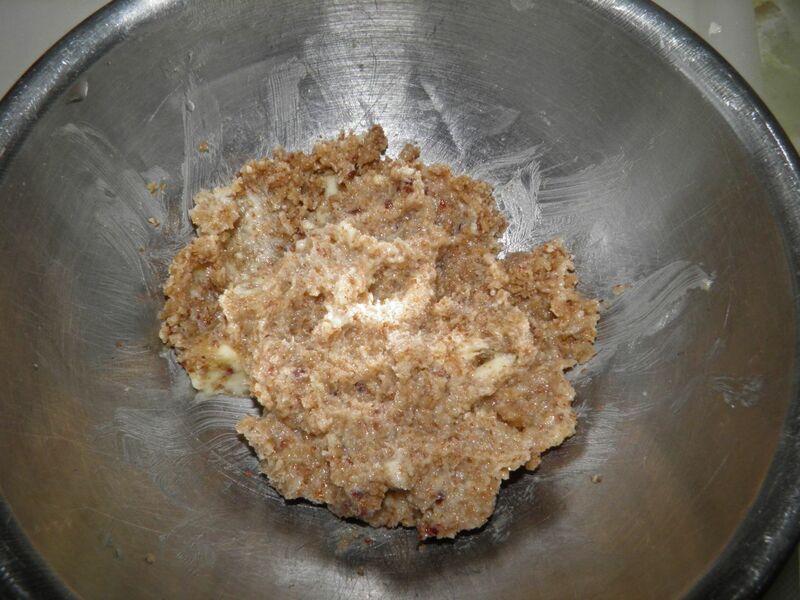 Then add the torn bread and pulse until well incorporated. Transfer to a bowl and knead in the butter, marjoram, pepper and salt (both to taste). Pat the mixture on top of the chops and bake for between 15-25 minutes. The time will be determined by the thickness of your pork chops. Turn the broiler on for the last minute or two to brown the top.